I found these pretty red tulips with yellow edges at the local grocers. 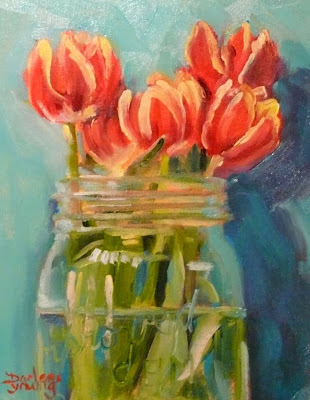 I haven't seen tulips since the spring and I just had to paint them. I've been stuck on the girl in the library painting lately. Sometimes when I'm on a big painting I find I find it hard to break away from it onto something else. But sometimes it's the best thing I can do.